We Know Jacksonville! We're Here For All Your Home Improvement Needs. For Complete Bathroom Remodeling, Call Us Today. Serving the Jacksonville area and surrounding communities, Ron Ardary Construction knows how critical it is to choose the right contractor for your building needs. 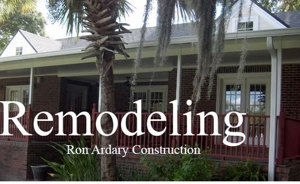 A specialist in commercial and residential construction and remodeling, Ron Ardary Construction has been the top choice for many businesses, city governments, non-profits, and homeowners for over 23 years. From home remodeling, room additions and new construction, to kitchen remodeling, bathroom remodeling, and commercial construction, Ron Ardary Construction can take care of all your contractor needs. An experienced commercial contractor, Ron Ardary Construction has constructed a wide variety of commercial projects which include industrial, institutional and retail spaces. Churches, schools, restaurants, country clubs, etc. Ron Ardary Construction will get the job done. The company has completed a number of corporate and regional commercial construction projects that have brought pride to business communities making Ron Ardary Construction a well-known name in the region. Call us today for more information on our services at (904) 323-4453. Copyright © 2018 ardaryconstruction1.com All rights reserved.